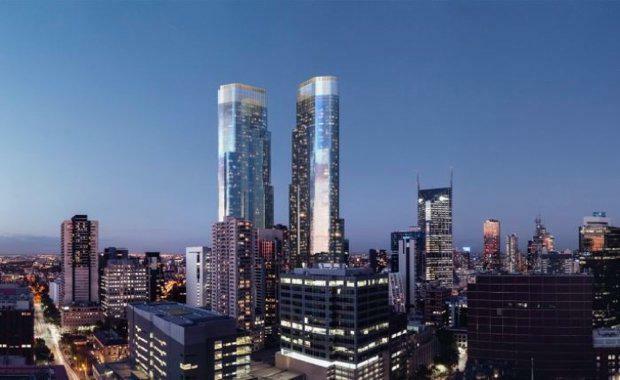 The Victorian State Government has approved a $750 million two-tower development on Queen Street in Melbourne's CBD. The two 79-storey towers at 350 Queen Street will include almost 1,600 apartments, 8,000 square metres of office and retail space, 554 car spaces, 603 bike spaces, a new childcare centre, a gym and a supermarket. The development includes a mix of one, two, three and four-bedroom apartments, reflecting the growing demand for larger inner-city places to accommodate families. The approval includes a condition for both buildings to be set back at least 4.5 metres from the street. Minister for Planning Richard Wynne said the development was well-designed and would provide apartments as well as new services to support the CBD's growing population. “Population growth around inner Melbourne means another 45,000 homes will be needed by 2031 to accommodate 80,000 people," he said. The towers are being developed by Chinese developer 3L Alliance.